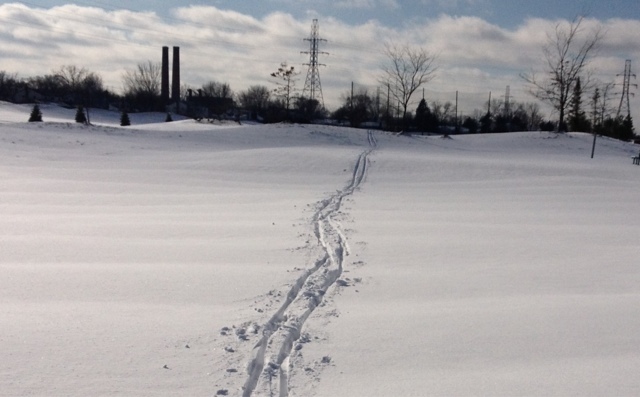 My first memories of cross country skiing are a mixed bag. One one hand, I remember the heavy, wet, cotton t-shirt sticking to my chest and gloves so thick with perspiration that I could wring them out to get a drink with all the while wondering out in the middle of a trail when will it be over? When will I see the lodge (aka: golf course clubhouse) and be able to turn in these stiff boots and pencil thin skis and retreat to the car with maybe a Snickers and Hot Chocolate? On the other hand, I remember gliding through the trail at a snails pace at the wonder and beauty of a winter wonderland. I didn't crave the speed down a hill, I wanted and needed to soak it in. My body working hard to get into some sort of rhythm and knowing that not when I was done, but later on, that I would have a pleasant dull ache in my muscles. I was 12. When we moved to Michigan, my dad thought it would be fun to take my sister and I cross country skiing. The first time it was hard. Trying to snap into the three holes on the skis and getting up when you would inevitably fall down were all to common. However, once locked in and gliding along, it was for me a lot like running. Steady as it goes and gliding into a flow. Little did I know that he had planted the seeds in me for it to become a seasonal sport that I look forward to. These memories, long since thought about, came flooding back when I strapped on my skis the first time this season. Untouched powder on a rolling golf course was all mine. I was free to carve a path up for others to follow if they so choose. Free to move on the snow in a graceful glide. Before marriage and kids, we rescued Nemo. He had been an abused dog when we first laid eyes on him at a Meet Your Best Friend at the Detroit Zoo event. It was a match that almost wasn't. He was the first dog we saw, and we had told ourselves at the beginning that we weren't going to get the first dog we saw. However, we quickly decided to go back for him and the volunteer seeing us coming back, deftly talked a family out of getting him because of all the energy that he would require. They knew we were runners and thought Neo (his adopted name) would be happy together. Neo turned into Nemo after our favorite watering hole near old Tiger Stadium and we were a family. 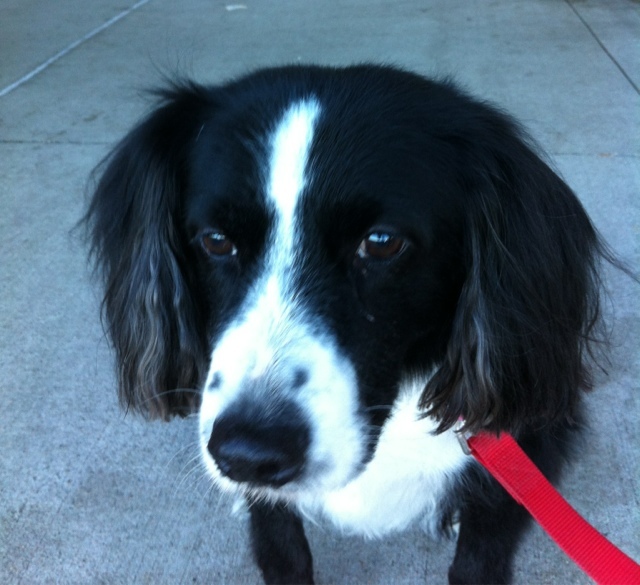 I had longed to have a dog that I could run with, and Nemo was a willing partner. Faithfully, every day he would be up and waiting for me to run. He would run slightly ahead, low to the ground and kept a steady pace.He was all that you could want in a fellow runner. He never missed a running date, and listened to my diatribes. In snow, I would spray his paws with PAM so they snow wouldn't clump up and he would trudge on. He was most at home on the trails though when we got out there. Off the leash, he was free to run ahead and always stopped to check and wait for me. My running log for several years was filled with his weekly mileage to make sure that he didn't overdo it, and yet he still logged thousands of miles. When kids became part of the mix, he took his side right next me as we rolled down the road. One dog, one man, and one jogger. The abused dog we had adopted had morphed into a loving dog who all the neighborhood kids would play with. Time inevitably slowed him down and the runs became walks. Eventually, those walks became just letting him out to go, but he still retained his spirit. A nudge here with his cold nose or a paw flicking at you brought treats and petting. We told ourselves that we wouldn't let him get to the point where he began having more bad days than good, and when the scales began to tip in that direction it was one of the hardest decisions we had to make. I was unwilling to keep him going because of my selfishness of wanting to have him around every day. The morning we decided, I ran our old dog park loop by myself which was one of our daily run routes. I had to let my emotions spill out on the road and had myself a good cry. One of several that day. My wife knowing that I was far too emotional to bring him to the vet, offered to take him after work. I came home early, and dammit, if Nemo wasn't moving around better than he had in days, but I new it was just a ruse. I layed on the floor with him and I think he knew it was time to go and was telling me that it was ok as he nuzzled in and licked my hands. Thank you Nemo for being what George Sheehan had written for us as man to be which is first a good animal. .
Post long runs I love a big breakfast. Heck, I love breakfast in general. Pancakes, eggs, burritos, potatoes, and pots of coffee...it's all good. I mean isn't that why we run to some extent? To eat? 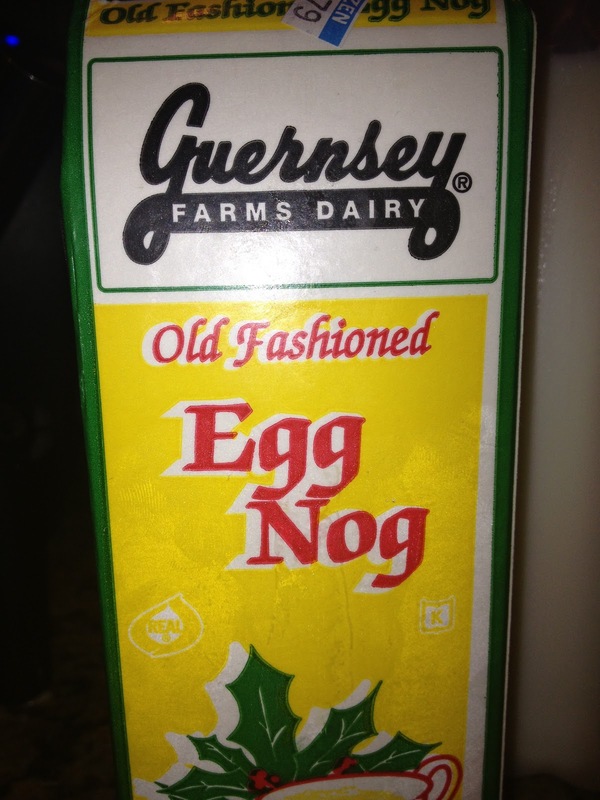 Good ole egg nog. 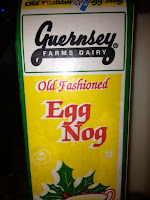 The thicker, the better, and yes even the Egg Nog Shake from the Golden Arches is quite delicious. Calories....meh, I'm not counting them. It's an indulgence a few times a year. Anyways, I was plodding around the tubes of the internet the other evening and ran across this recipe via http://fueledbylolz.com/ that seemed like a great marriage, egg nog as an ingredient in pancakes. Perfection. In order to properly indulge in this, I figured that a 10 miler was the penance that I would have to pay in order to enjoy. Rolled the miles this morning and then into the kitchen to whip up the following recipe. Dash of cinnamon (had to scrape the tin we had...it was a dash at best). Mix the wet ingredients then add in the dry ingredients. 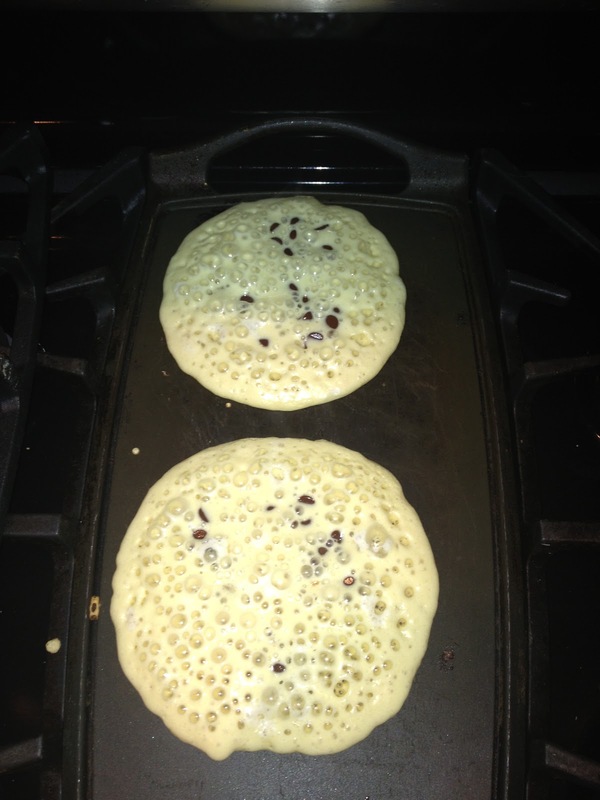 Cook on a griddle or try them out in waffle maker. On medium heat, I used a 1/4 cup scoop to measure out and dropped a few chocolate chips in. I liked how light and airy the recipe was as evident by the bubbles all over the surface of the pancake just prior to flipping them over. My kids who said, "Yuck!" when I was adding egg nog to the mixture, quickly asked for seconds. For me, that's how I know a recipe is good. Thumbs up from the kids. As for me, the only thing I would try next time is maybe add a dash of nutmeg, and it probably needs a liberally helping of whip cream before digging in. For presentation purposes of course. Enjoy! !